May is here and we have Chelsea Flower Show in our sights. At the end of this month, whether it’s via daily broadcasts, or visiting in person, national and global garden fans will happily home in on this very special showcase of the latest garden genres and planting projects. As it does at Garden Requisites, contemporary styling meets traditional, tried and tested design in a fabulous fusion of colour, texture, structure and scale. It really is incredible that so much horticultural excellence can be squeezed into a space that is effectively the size of two football pitches. Chelsea Flower Show is a shining example of what can be achieved in a confined city space and the micro-gardens contained within the show distil the concept further. We can’t wait to consume these clever exercises in garden design again, which always get us thinking about helping our own customers increase their city garden design square footage. Space savers for town and city gardeners, bobbing in a sea of concrete and brickwork, can include cleverly placed planters, troughs and trellis. Considering gardens within gardens, window boxes are also a wonderful way to pack a punch with formal or informal planting to adorn modern or period properties. First, ensure that you invest in the best, longest lasting, metal window boxes. That way, once the window boxes are up, often in at awkward heights, they are up for good. 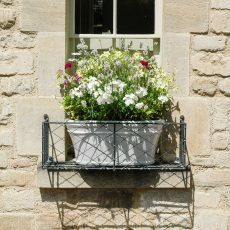 Our galvanised steel window boxes come in a variety of designs to suit different styles of property – Traditional Wirework, Ironwork, Crescent and Contemporary. Which plants for window boxes? With endless warmer weeks in sight, May is the perfect month to plant up window box containers with either evergreen formal interest – Buxus sempervirens (Box), Hebe pinguifolia ‘Pagei’, Juniperus squamata ‘Blue Star’ (Juniper), Trailing Ivy, Echeverria or Sedums – or more colourful floral displays such as Geraniums, Lobelia, Antirrhinums, Pansies, wild annuals and so many more. Herb window boxes can also be installed on a kitchen window or balcony for quick access to convenient culinary clippings. For visual inspiration, do take a look at our Metal Window Boxes Pinterest Board. Or will you be holding out to top up your plant trend tanks at Chelsea? If you do, don’t miss the wider community ideas at Chelsea Fringe, which bursts forth with garden ideas and events for two weeks in late May and early June. In the meantime, to get your fill of capital city garden life, we’ve prepped a neat Pinterest collection of London Gardens. Enjoy!